What about a cute handbag to hold your gift card ? Sizzix has the cutest die for it. It's a Bigz XL bag with handle and flap, means that you need the longest pad for it. 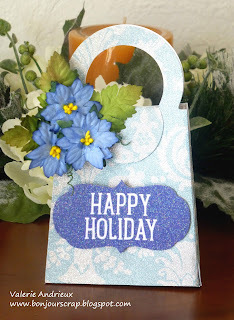 The bag is cut into the Holiday Glitzy Glitter paper (DCWV), the tag is from the Winter favor boxes stack (DCWV). I added flowers and leaves (I Am Roses) to make a cluster at the top. Did you comment already on one of my card holders' posts ? If not, do not hesitate, by doing so, you will enter my giveaway featuring a banner stack by DCWV ! So follow me and comment each day if you want ! I came over to your blog because of the Stack-a-holic card featured on it Dec.2nd. Loved it and this fabulous little bag! Am your newest follower by the way! This is a cute designs. I like the way you decorated the little purse with the flowers. They are the right size and color for this too. Lovely!